Greater MSP did not perform a government function when it assembled an unsuccessful bid to land a second Amazon headquarters in Minnesota, the nonprofit claims in an Oct. 23 court filing. Nor did it have a contract with the state to assemble that bid, that memo says. Therefore, a judge should dismiss a lawsuit filed by watchdog group Public Record Media (PRM) that attempts to compel the bid’s release, the memo states. The Department of Employment and Economic Development agrees in its own memorandum supporting Greater MSP’s motion to dismiss. That document also was filed in court on Oct. 23, as were six accompanying affidavits and declarations from DEED and Greater MSP lawyers and staff. Greater MSP’s memo, written by Briggs and Morgan attorney Daniel J. Supalla, says Public Record Media incorrectly asserts that DEED can access the bid. It can’t, the memo argues. The formal bid, the Supalla memo asserts, exists solely in the form of eight authorized printouts, all of which are possessed by Amazon, Greater MSP and Briggs and Morgan. DEED has no copy, Supalla asserts, and therefore cannot produce one. Supalla argues that, were a judge to accept plaintiff’s argument that DEED at some point had access to the bid or its early drafts, mere government-employee access to data does not subject it to disclosure under Minnesota’s Government Data Practices Act. Further, he writes, if PRM convinces a judge that the Data Practices Act’s privatization provisions apply in this case, it wouldn’t matter because the bid contains protected trade secrets. The Data Practices Act requires data disclosure by third-party contractors working with government agencies, but makes some trade-secret exceptions. Both DEED and Greater MSP are being sued by Public Records Media to produce the bid. Gov. Mark Dayton and DEED Commissioner Shawntera Hardy also have called for Greater MSP to disclose the bid, according to the filings, but so far the economic development office has refused. Likewise, DEED’s memo states, Greater MSP — described as a “public-private partnership” on its own Facebook page — has refused to release the bid to DEED so that the agency can release it. 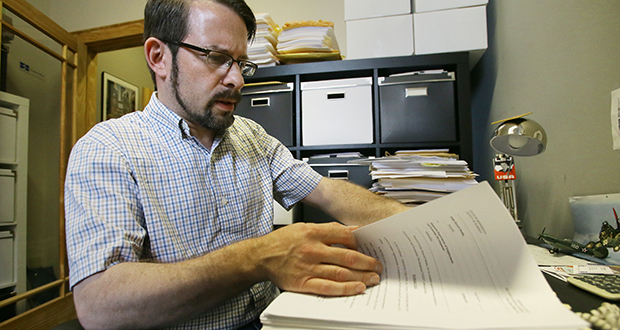 Matt Ehling, PRM’s executive director, said Wednesday that the 7,600 pages of records — including email correspondence — that have been released to his group indicate that the Amazon bid was a clear collaboration between DEED and Greater MSP, on behalf of Minnesota. Therefore, he said, Minnesotan taxpayers deserve to know what Amazon was promised in their name. Yet a separately filed declaration by Greater MSP CEO Michael Langley asserts that his organization formed no agreement, “oral, written or otherwise,” concerning the Amazon bid. Greater MSP acknowledges in its memo that, at a minimum, it considered the state government an equal partner in the effort—at least up to the point where the bid document was drafted. Public Record Media initially sued DEED alone after the agency declined to include the final bid, or any of its prior drafts, among the records it produced at the group’s request. It added Greater MSP to the suit after it was told the nonprofit alone has it. DEED said it could not release the bid, because it doesn’t have it. The bid was locked away — apparently in electronic form — on a password-protected file-sharing service known as “The Box,” which Greater MSP controlled, the agency said at the time. “DEED did not and could not produce the proposal or any drafts of the proposal to PRM because DEED did not collect, create, receive, maintain or disseminate that data,” the agency’s Oct. 23 memo says. Those serial terms are all included in the Data Practices Act’s definition of government data. To interpret it to include “access” would be to “impermissibly and substantially broaden” the statute’s scope, argues DEED’s memo, written by Assistant Minnesota Attorney General Christopher M. Kaisershot. Greater MSP says the Amazon bid was assembled using data that DEED submitted electronically into “The Box,” which is password-restricted. Colleges and cities in the 16-county area surrounding the metro area also contributed information, but via email, the Supalla memo says. That strategic component is what gives the Amazon bid “independent economic value” to Greater MSP, the Supalla memo says. That triggers the Data Practices Act’s trade secret exemption, the memo indicates. Ehling said he finds that claim odd. When DEED responded on Oct. 11, 2017, to a legislative request for a “top level summary” of the bid, a DEED official responded via email that bid included things like labor market data, proposed sites and regional information on regional higher education, transportation and recreational opportunities, among other things. Ehling said he worries that if Greater MSP and DEED succeed in their effort to kill the suit, a bad precedent would be set for public disclosure. “If they succeed in getting the case dismissed, what they have found is a recipe for how to avoid public oversight when they are dealing with these kinds of private business development submissions,” Ehling said. The case is scheduled for a motion hearing on Nov. 20 in the courtroom of Ramsey County District Judge Leonardo Castro. Public Record Media’s response to the Oct. 23 filings will be filed in Ramsey County District Court sometime around the week of Nov. 5, Ehling said.